Offering you a complete choice of products which include Overhead Drum Clamp, Hydraulic Tube Bundle Extractor, Hydraulic Scissor Lift Platform, Battery Operated Pallet Truck and many more. Our company is an integrated company which integrates the design, manufacture/marketing, sale and installation of high-quality operation working Battery Operated Pallet Truck. We offer a large variety of Electrically Operated Stacker with advanced feature for easy loading and unloading to our valuable clients. Lift is designed in such a way that operator can use it as a work bench, hand pallet truck, or lifting table. 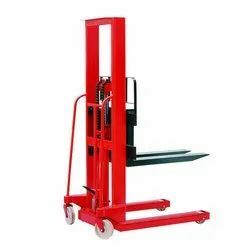 With lifting technologies such as reinforced chassis and closed forklifts, Scissor Lift Pallet truck’s ergonomically designed handle dramatically help you to lift loads at desired height. Lifting Equipment’s robust single cylinder pump avoids high maintenance requirements, thus ensuring value for money. 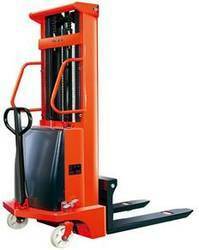 With up- to 1500 load capacity and maximum fork lift height of 800m. The two-mast aluminum alloy lifting platform has the advantages of being large in carrying capacity, greater in table surface, high in stability and high in lifting height. 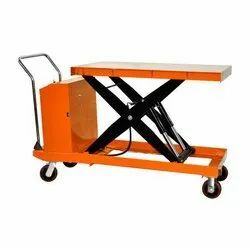 The carrying capacity can reach up to 200kg.The table surface is above 1.2m,which is suitable for the high altitude working with 2-3 persons. The stability of the two-mast aluminum alloy lifting platform is higher than that of the single-mast aluminum alloy lift because of the two sets of the masts. 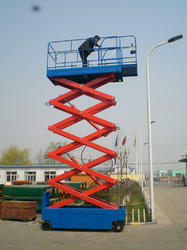 The maximum height can reach up to 14 meters, which is the untouchable height of the single-mast aluminum alloy lift. same with other high altitude working equipment, the two-mast aluminum alloy lifting platform is provided with the up-and-down controlling function from Switch control at the platform and at the ground. 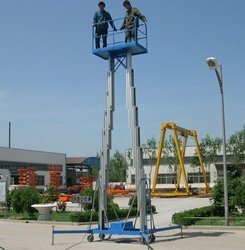 The two-mast aluminum alloy lift can be widely used in the places of the experience fields, the hotels, the restaurants, the stations, the airport, the movie theaters ,the exhibition buildings and the like, which is the best safe helper for the applications of the maintenance of the machines and tools, the oil paint decoration ,the exchange of the lamps ,the electrical equipment, the cleaning, the maintenance and the like. 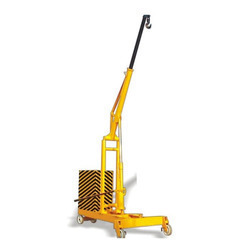 Scissor LiftMovable scissor liftsare used where more workspace and lifting capability is required. Can be easily and Flexibly operated in crowded working conditions such as construction site, elevator, and narrow corridor. Lift-up, lift-down, turning, forward and backward movements can be easily done by one person. Available in 6 m, 8 m, 10 m, 12 m and 14 mtr. height. Drum Clamps offered comes in precision construction finish and offer support for up-right lifting. Can also be made available to OEM specifications as demanded from us. 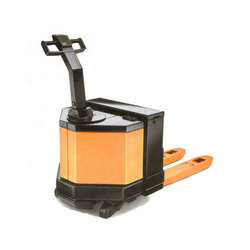 On an aim to meet the requirements of clients, we are engaged in offering the finest quality Hydraulic Pallet Truck. The offered range of truck is manufactured using the best quality metal and modern technology at our production unit. This truck contains wheels and can be easy to move in all industry based material handling purposes. 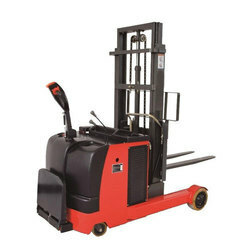 Our offeredHydraulic Pallet Truck is available in different sizes in order to attain clients satisfaction in all manners. Lower maintenance costs due to fewer breakdown. Easy pallet entry with tapered fork ends. Sealed dust free hydraulic unit. 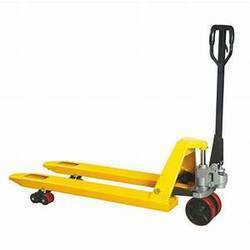 Hand pallet truck: 1.5T,2.5T,3.0, 5.0 T load capacity,High reliability, suitable for a variety of environments.It can be used for 3-5 years under normal maintenance. 54mm fork thickness ensures high capacity. High-strength alloy steel fork frame. 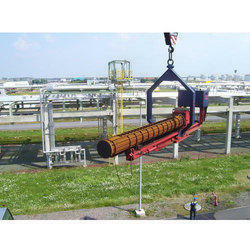 Hydraulic Floor crane : We manufacture different type of floor crane. One with out counter load and second with counter load (as safety feature). Having capacity 1,2 and 3 ton. 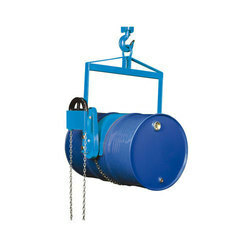 · Mostly used in lifting and handling of pumps, motors, gear boxes, engines etc. Its very useful for maintenance people as well as who are related to erection and commissioning of machineries. · Strong, robust, sturdy and built to very high standard, fitted with 360* rotating hooks. We make custom design hydraulic floor crane also with 4 and 5 ton capacity. 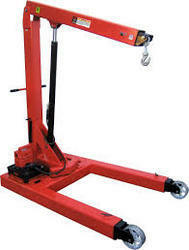 Hydraulic floor crane with counter loading arrangement for extra safety and to resist tilting, capacity- 1/2/3 ton. Operated by separate hydraulic hand pump, minimum boom height- 750 mm, boom length- 1650 mm, Extension- 1050 mm, Total length of the equipment- 2000 mm, Leg clearance- 1200 mm, height- 1900 mm, Maximum Extended height- 4000 mm, wheel dia. 300 mm. Being the leading names in the industry, we offer quality assured array of Hydraulic Tube Bundle Extractor that are manufactured with accuracy. Our entire product range is sturdy in construction and has high tensile strength. Hydraulic Tube Bundle Extractor ensures long functional life and is offered in well-defined time period. 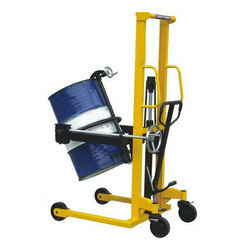 Semi Electric Forklift Stacker with a load capacity of 1000/1500/2000 kg and a semi electric hydraulic lift height of 3.3m. It has a manual pull/steer and comes with battery and charger. Up & Down movement with 24VBattery & manual pulling & pushing. 3HP, 24VDCelectric motor for lifting with Dowty make oil gear pump. Operated by 24Vheavy duty contactor. Lever operated directional control valve with inbuilt pressure relief valve for up & down movement. Oil tank with oil level indicator, oil breather, suction strainer etc. Battery – 24V, 85Amp- Hr,Tubular monoblock. Aseparate 24VDC, 230 VACbattery charger is needed to charge a battery.